﻿ Quantum theory and the search for the soul. Can we explain 'magic' using quantum theory? Can science and ancient wisdom agree? Can science understand the spirit and the soul? This erudite book, written by a leading Italian astro-physicist, explores the latest frontiers of spiritual and scientific thought. Dr. Massimo Teodorani is an Italian astrophysicist. He obtained his degree in Astronomy and his Ph.D. in Stellar Physics at the University of Bologna. As a researcher at the Astronomical Observatories of Bologna and Naples, and later at the INAF Radiotelescope of Medicina (BO) he has been involved in research on many types of explosive stellar phenomena, such as supernovae, novae, eruptive protostars and high-mass close binary stars and, more recently, in the search for extrasolar planets and extraterrestrial intelligence within the SETI Project. He has published 17 books and many articles on quantum physics, atomic and nuclear physics, astronomy, astrophysics, bioastronomy, physics of anomalous atmospheric phenomena and aerospace subjects. He is well known to the media and has given many public presentations. This illustrated book provides a brave and revolutionary theory of everything by a scientist prepared to look beyond current scientific dogma. Now also published in paperback. Standard science has established that matter/energy and mind/consciousness are separate entities. Cartesius called them respectively "res extensa" and "res cogitans". The present scientific paradigm, that started with Galileo and Newton four centuries ago, assumes that this separation is the basis of the experimental and mathematical method of science, and of the logical reasoning of philosophy. Certainly, positivism, with its rigor and criteria of repeatability, has produced irrefutable results in all fields of science and technology. For example, classical and non-classical physics (such as relativity and quantum theories) have been able to offer us an objective picture of reality, even if the quantum world has taught to us that determinism is no longer valid in the realm of elementary particles. Despite this, a mathematical description provides a sure scientific method, even when experimental proofs are lacking. The Universe is written in mathematical language reflecting a system of laws, or structure of order, inside the reality around us. And the function of a scientist is to reveal, in an explicit and quantitative way, what Nature has constructed. So, are science and reality ontologically the same thing? We agree that science provides a useful, highly logical, map of reality. But we cannot be sure that it represents the entire territoryif recurring anomalies are totally ignored. If science continues to ignore such incongruities, it will no longer be scientific enough and will become a dogma not so different from religion. Unfortunately, many scientists are all too willing to accept their own canon. This may be valid when applied to the scientific method, which no one can question, but erroneous when applied to scientific knowledge. Except for some totally established facts, such as classical mechanics, electrodynamics and atomic physics, other scientific theories, for instance, the Big Bang theory and the Standard Model for elementary particles, still wait for full confirmation. In fact, there are different theories, equally rigorous, well able to explain the same facts. For instance, the stationary state theory, superstring theory and quantum loop gravity. The former standard theories for cosmology and structure of matter are certainly convincingin particular the Standard Modelbecause they offer many observational and experimental evidences. But, although their elegance and quantitative value is obvious from a mathematical point of view, much incompleteness remains. Examples: We do not yet know if magnetic monopoles and mini-black holes exist. We do not know exactly what is the true component of dark matter. We are not totally sure that the neutrino has mass. We do not know if electrons and quarks contain something else inside. We do not know if particles are point-like objects or infinitely long strings. And, in spite of encouraging results recently obtained, we are not totally sure that the Higgs boson is really a field that confers mass to all the particles. Science and physics (including astronomy) proceed by logical tiny and cautious steps and produce numbers coming from laws that we are able to deduce from observing reality. These laws are exactbecause formalized only by mathematics. But are they really the territoryor simply a logical map of what we think reality is? Our knowledge is epistemological but not yet ontological. Why? Because, as scientists, we behave as external impartial observers and not as the components of this reality as we live it. In other words, we describe reality as if we are not living inside it. So what should we do in order to describe reality better? What kind of scientific knowledge might evolve if we cease just observing things aseptically? Certainly, the best way to be rational, as science demands, is to remain objectivenot to identify with what we livenot to mix our rational approach with an emotional one. However, reality is not confined to rationality. It also involves emotions and spirituality. There is far more to Life than the rational mind. Certainly, rational thinking helps us describe and understand our surroundings, including our body as a physical entity independent from our person. But emotions and spirituality are the way we live the reality we describe, even if not a functional method to understand physical reality itself. Yet they are reality as wellour own reality and the reality of human interaction. Why shouldn't we attempt to describe our emotions scientifically, too? The true Universe is not only made only of atoms, stones, stars and animals but also of sentient and spiritual beings. And true reality is a continuous interaction between a boundless landscape made of objects and the subjects populating it, who in their turn interact together. Therefore, reality is a much more complex entity than the one science normally describes. We know much of that landscape, but know nothing (in exact scientific terms) of what we truly are. You may argue that Psychology and other human sciences describe the interiority of persons. But this kind of theorization seems somewhat empiric, qualitative or speculative in its models. It often borders on religion and can be irrational as well. It lacks the exactitude with which science is able to describe external reality. Human behavior is unpredictable and our ignorance of what we are is clearly a major problem for society. As the emotions of a single person or of a group of persons interacting together are explicated inside a very specific physical landscape and not out of it, one wonders if wider physical laws are able to describe reality in its totality using the method of exact sciencesas physics, for instance, can. Yet we seem to accept, from the scientific and technological results of the last 100 years, that our entire society is entirely ruled by "objective facts" and that everything outside this limitation is irrelevant. However, the world is affected by a deluge of emotions of which we know scientifically only a little, apart from their biochemistry. Consider our dreamsnot objective facts but still part of our reality when we sleep, and sometimes also when we are awake. The totality of a human being is made of the physical, of the intellect, of emotions and of dreams. Is science able to describe all this? Currently it isbut partially. So, we have a scientific map of how we are constructed but not yet an ontological description of what we arethat is, our true territory, which is boundless. A "total science" should be able to furnish a descriptionable to include both the physical and consciousness. 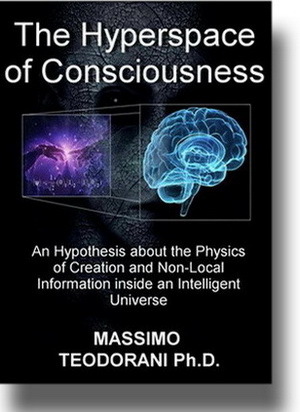 In this book I will amply discuss the possibility of describing consciousness and related topics scientifically. Subsequently I will focus the attention on a new hypothesis which describes the possibility that our consciousness is connected to a "cosmic data bank" from which it is possible to "download" information and at the same time to "upload" our own "data". It will be seen in the following reasoning that this new model of reality can explain several other phenomena, which appear to be connected. Of course nothing of what will be said can yet be demonstrated scientifically, as, except for some established aspects, it is mostly a sort of logical speculation. Such a speculation is intended to be a stimulus by posing several questions that sciencephysics in particularhasn't yet solved. Science was not designed as a mere management of data or to perfect what we already know, but rather as an exploration process. Only exploration can make science evolve, because the goal of science is to acquire knowledge, which can be gained only after some crucial and even controversial problems are fully understood in scientific terms. The first step towards this process is to dare to venture a hypotheses, even the most apparently courageous. Some of such hypotheses may eventually be unnecessar y (this can be understood only by reasoning), but others may trigger new knowle dge. The goal of this book is to create a stimulus both to my colleagues and to others who have the patience to read it thoroughly. Here is no intent to present alleged "truths". There is nothing to reveal but a series of hypotheses and fundamental questions which might lead to a better and understanding of the reality in which we liveassuming that what we call "mind" and "matter" are two interpenetrating and continuously interacting entities. The intent is not to promote a philosophy or metaphysics but a physical science. The book has two main parts. The first deals with the spookiest findings of quantum physics in elementary particleswith Bohm's interpretation of quantum entanglement and his new cosmology where matter and mind are united into a single entity through what he calls "quantum potential", and with the most relevant theories about the possible existence of a "biofield" and the quantum nature of consciousness and of synchronicity. The second partthe longestdeals with: 1) my theory about the possible existence of a cosmic "Big Library" (BLHBig Library Hypothesis) able to link all living beings in the Universe using non-local processes through which information is vectored and triggering creation of new matter through the action of a hypothesized "supernal intelligence". 2) other related topics involving the role of the "spirit" intended as a physical and non-religious concept and the possibility that the spirit may occupy after death bodies of non-biological nature, and finally the search for extraterrestrial intelligence using non-local methods. Asexcept for the first partit is based on several quite courageous hypotheses, this cannot be considered a science book but rather a "science-fiction" text from which, one day, true science might be born. As explained, I am attempting here to blow on the fire under the ash. This text is a trigger directed in particular to my most unprejudiced and open minded scientist colleagues. After all, every means is good that leads to a concrete result. The science expected to evolve from this is rational, but not the close minded "rationality" of the ostrich. What is the truth concealed behind the door called self-awareness?